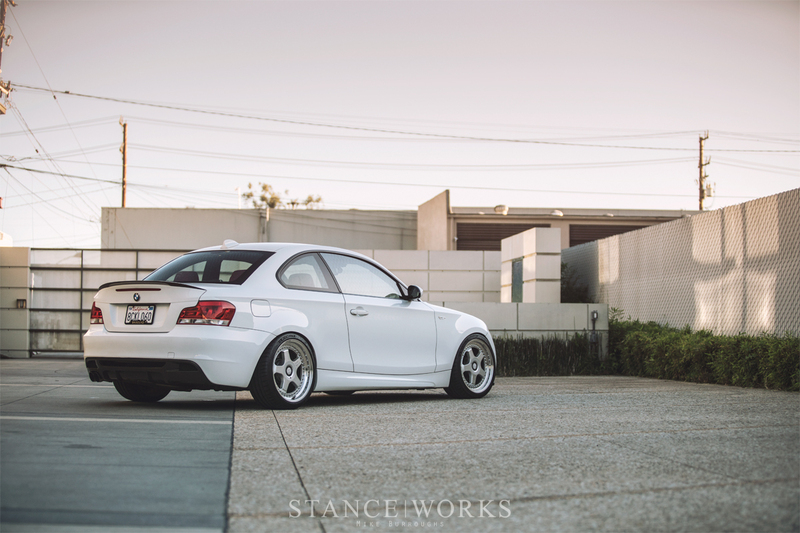 Jeremy began with the driver's space in an effort to make the car feel a bit modernized. As the Operations Manager at Bavsound, first and foremost was a complete audio overhaul. A complete Bavsound speaker system was installed, which includes 25mm tweeters and 100mm midrange speakers for all-around sound improvement. Underseat subwoofers were also replaced for a low-end boost, and lastly, an upgraded Bavsound Revenant amplifier was installed in the factory location of the trunk, tripling the power output of the factory radio with only one pound of added weight. 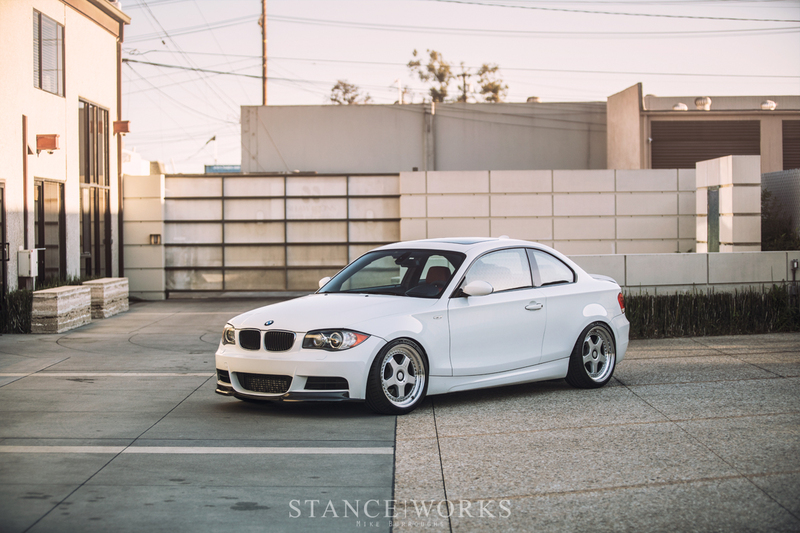 As a whole, the package improves the long drives from San Diego to Costa Mesa, here at the StanceWorks HQ. Other immediate interior changes include removing the bolt-in roll bar it once sported, and the addition of a Rennstall RSKT2 shift knob to compliment the BMW M-Performance alcantara steering wheel. The car's headliner was pulled out as well, and redone in black alcantara from the pillars up, completing the iconic "M car" interior feel. 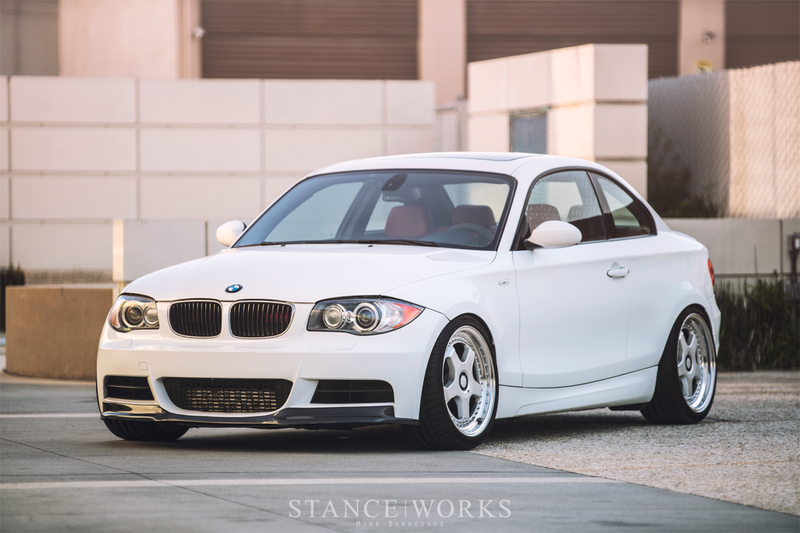 The experience from the driver's seat, with 420whp on tap, is an exhilarating one. The car inhales through its custom Fab Factory aluminum intake manifold, and is paired with a set of custom aluminum turbo inlets and charge pipes. Spent air and fuel exit through an Active Autowerkes cat-less downpipe and a custom 3.5" mid-section and a Berk Technology race cat-back exhaust. The remaining induction components are handled thanks to an Active Autowerkes intercooler and an HKS blow-off valve, helping to keep things cool and under pressure, respectively. A JB4 G5 ISO unit allows Jeremy to highjack the gauges, and of course, allows for boost control, which pairs well with a BPM Sport ECU flash. The result is an unsuspectingly quick car, and luckily, without a fortune spent to achieve it: one of the biggest draws to the 135i platform. 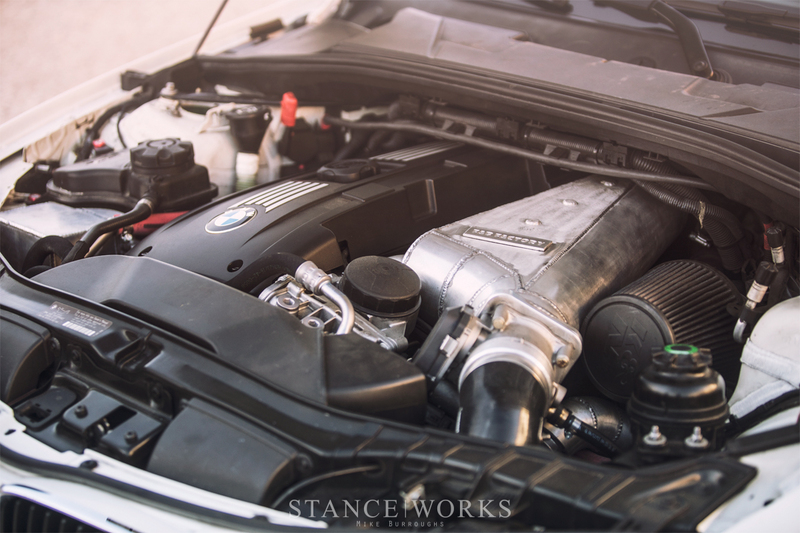 The aftermarket for the chassis and the N54 power plant have allowed tuners and modders to take numbers to the stratosphere: a newage 2JZ of sorts, in terms of standing as one of the most tuning-friendly turbo platforms on the market. 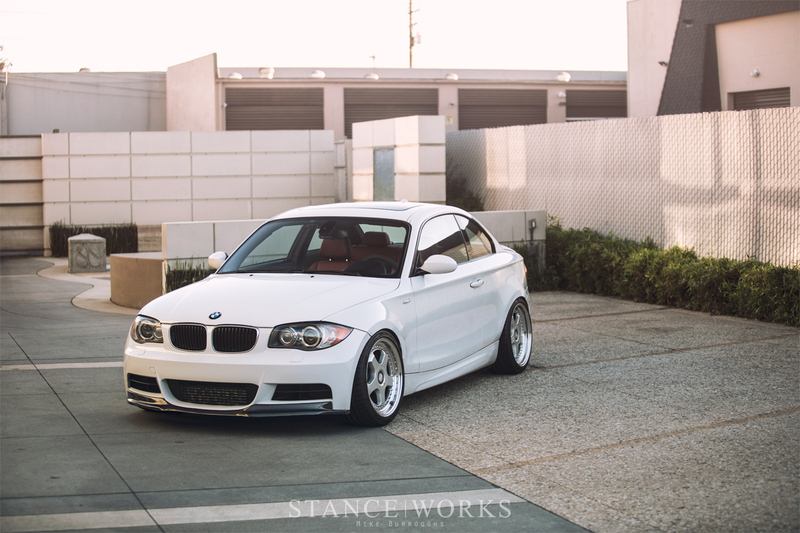 On the outside, a RW Carbon lip was fitted, enhancing the exterior lines of the 1-series' unique fascia. 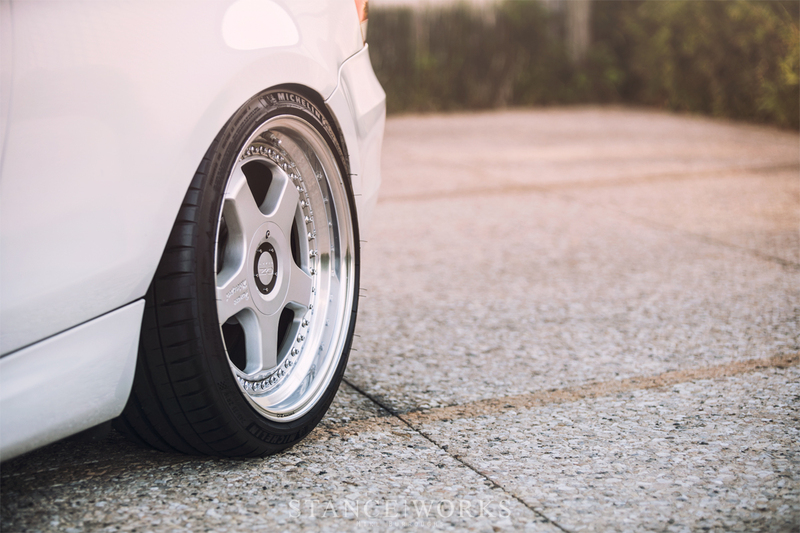 For a more drastic update, however, Jeremy sourced a set of 18x8.5 and 18x9 Hamann PG1s. 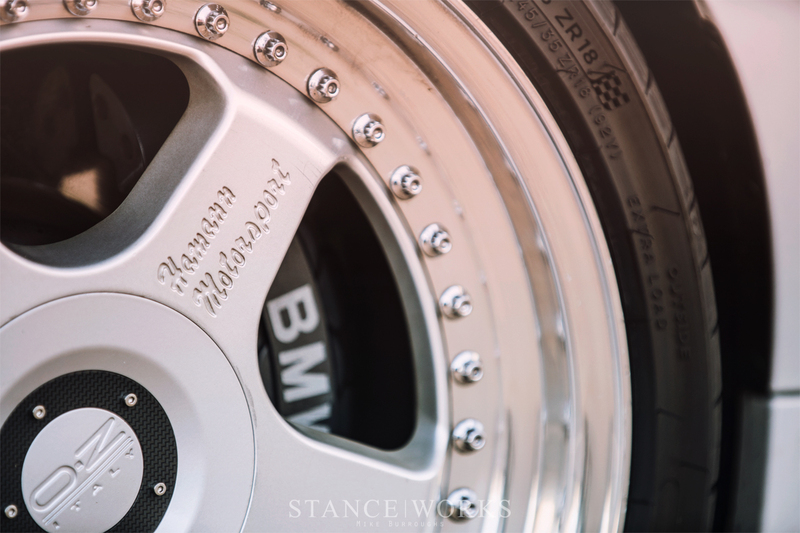 With a bit of offset work, the wheels fill the arches to the brim and update the aesthetics to something a bit more unique than its former CCW Classics. A set of 245/35 Michelin Pilot Sport 4Ss wrap the wheels and give the 135 incredible handling characteristics, as long as Jeremy keeps his foot light enough on the throttle to not roast the rears. 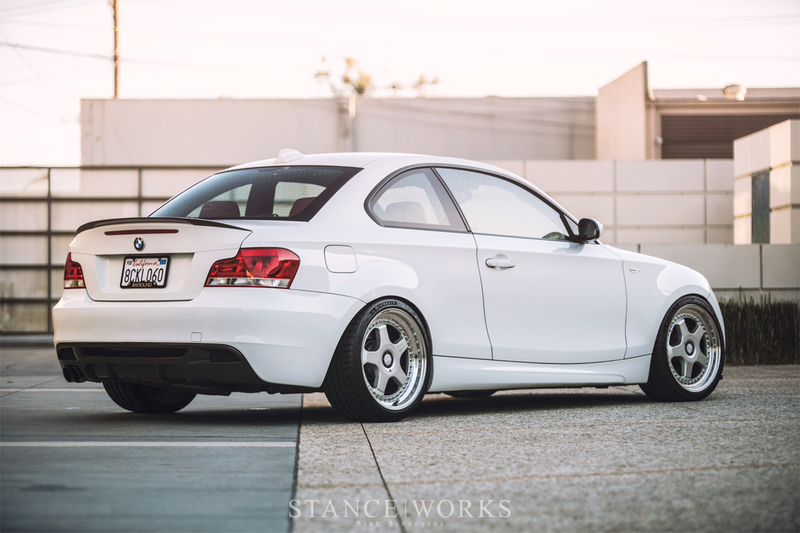 In all, it's a wonderful car to revisit, and with its new mods, it's an ideal take on a 135i fit for any occasion. Now though, Jeremy has moved on, and the 1 has headed north to Washington. Maybe we'll see it again?